If you've never heard of it, Brutal Doom is a mod that turns an already-violent shooter into something hilariously bloody and full of gibs. 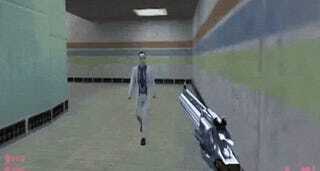 Well, Brutal Half-Life is that, only for Half-Life. A first playable mod was made available for the project last week, and you can see a trailer for it below. To focus only on the fact Brutal adds a ton of claret to the game is to do the mod a disservice, though, as it's doing much more than that. You'll notice from the trailer that it also introduces limb dismemberment, while there's also stuff like new weapons, improved AI, improved explosion effects and new attacks for the crowbar.